Hail Damages Horizon City Body Shop | The Voss Law Firm, P.C. On Tuesday, October 6, a hailstorm developed over Texas and dropped marble-sized hail on Horizon City. KFOX 14 reports that Dynamix Body Shop, which sits at the corner of Horizon Boulevard and Darrington Road, took damage in the storm and will likely be filing insurance claims for their losses. Saul Diaz, an employee of the business, said that the staff tried to protect the vehicles on its lot by moving them indoors. Unfortunately, not all the cars would fit. 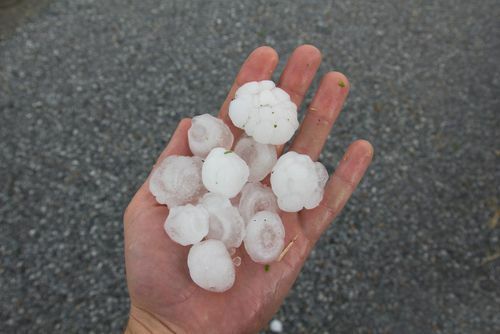 Residents say that the hailstorm only lasted about 10 minutes, but the body shop reported that around 20 cars may have been affected in the short-but-severe burst of hail. Damages included dents, dings, and damaged spoilers. Ultimately, the body shop was grateful that the damage to the vehicles and property wasn’t worse than it was, given the suddenness and severity of the storm. This hailstorm—which also affected El Paso, Las Cruces, and Fabens—was only one of the numerous severe storms to hit Texas at the start of the 2015 autumn season. Because of the number of storms and property losses reported, home and business owners filing insurance claims may have a wait in store. ABC-7 in El Paso reports that hundreds of homeowners, businesses, and vehicle owners across Texas have already filed claims for property losses, and more are expected in the coming weeks. Insurance companies are struggling to keep up with the number of claims, and some companies are deploying additional adjusters to get to all the damaged properties. State Farm in El Paso was already reporting 480 auto claims from the storms. Insurers hope to start with the most serious claims, such as damages that affect a building's use, and then move on to less severe claims of hail damage. Roofing repairs may also be delayed as local roofing companies handle a huge number of calls about roof damage in the area. Unfortunately, the cooler weather of autumn also means that roofing crews may be delayed in performing repairs because some of the glue they use only works properly in warmer temperatures. It all depends on the type of roofing involved. However, even though delays are likely, business owners still deserve fair treatment from their insurance companies. If you are a business owner who is having trouble with excessive delays or underpayments on hail or roof insurance claims, don’t hesitate to contact our experienced policyholder attorneys for help at 1-888-614-7730.